E-commerce has really exploded over the last few years and, not surprisingly, Amazon is one of the leaders in this trend. Many vendors have found that Amazon provides the most convenient and customer-friendly platform to sell just about anything. One of the best and newest services offered by the online retail giant is Merch by Amazon. Merch Informer is a new and innovative service that helps you research, organize and manage your Merch by Amazon business. Let’s look at some of the features and benefits of Merch by Amazon and how Merch Informer helps you get even more out of Amazon’s latest e-commerce platform. Don’t miss our exclusive Merch Informer discount coupon and bonus offer as well. Merch by Amazon provides a way to create branded t-shirts that are produced and shipped by Amazon. It’s actually a variation on the POD (print on demand) model used by services such as Cafe Press. The big difference here is that the company producing the products for you is Amazon, which is also the best place to sell them. Essentially, all you have to do is come up with the design. Amazon provides templates that let you turn your design into a t-shirt using Adobe Illustrator, Adobe Photoshop or Gimp. With Merch by Amazon, you don’t have to stock merchandise or ship anything yourself. You don’t have to pay for anything up front. In this manner, it’s like any other POD service or dropshipping. You upload your design, sell it on Amazon and when someone orders it, Amazon ships it and you pay a commission. While Merch by Amazon currently only supports t-shirt sales, there’s a good chance that in the future other products will be available. Merch by Amazon is currently only available by invitation. However, anyone with an Amazon account is free to apply. As powerful a system as Merch by Amazon is, this doesn’t mean you can simply choose any design for a t-shirt and start raking in thousands of sales. E-commerce, especially the t-shirt market, is extremely competitive. You have to choose your niche carefully and come up with great designs. Merch Informer is a tool that fills in some of the gaps and helping you succeed with Merch by Amazon. Merch Informer was started by two entrepreneurs, Neil and Todor, who both have extensive marketing and online commerce experience. They were also among the first to set up accounts with Merch by Amazon. After creating a lucrative t-shirt business they sold it, deciding to devote their time to help other merchants. Merch Informer was created specifically for the Merch by Amazon platform, though it’s also useful if you’re selling elsewhere, such as on Cafepress or Shopify. Many successful online sellers today sell their merchandise on multiple sites. Let’s explore some of the features offered by Merch Informer. One of the main factors that determine your e-commerce success is your niche. There are millions of t-shirts for sale online in thousands of niches. How do you choose your market? People often like to sell products in areas that interest them or in which they have expertise. That doesn’t always work when you’re creating t-shirts, though. You have to make sure you’re choosing a popular niche. Merch Informer helps you identify popular niches where products are already selling. You can easily see data for best sellers, estimate monthly sales, competition and more. Merch Informer lets you do advanced keyword research based on Amazon’s own search engine. The auto-suggest feature lets you start typing a phrase and getting a list of keywords that match products selling on Amazon. There’s also an option to search Cafepress, another popular platform for selling t-shirts. There are several features on Merch Informer that help you track your competition. Brand Spy lets you see, at a glance, what the top brands are and how well they’re doing. If you want to do research on a particular brand, you can access important data about products that are selling well, such as ASIN, price, features, description and sales rank. This helps you plan your own successful campaigns. It’s possible to study your competition manually on Amazon, but it’s time-consuming. Anyone who works with Google AdWords has probably used advanced tools to analyze keywords and competition on Google. There aren’t as many ways to delve into your competition on Amazon, though – unless you use Merch Informer. By typing in your keywords, you instantly get a profile of the competition and how much room there is for your own design. Just as marketers doing traditional SEO seek long tail keywords, as a t-shirt seller, you want to identify possible designs and slogans that are popular but not saturated. Merch Informer’s advanced competition checker helps you do this. Another crucial aspect of online commerce is creating listings that are highly visible and compelling to customers. Merch Informer has a listing optimizer that helps you create the best possible product descriptions and keywords, making it easier for customers to find your t-shirts. The most successful sellers online often use many designs. You may also hire different designers for various campaigns. Over time, you may have hundreds of different designs, which can make it challenging to keep everything organized. Merch Informer has a favorites feature that ensures you can access your favorite designs and find them by category, designer, price, or description. One of the biggest headaches of selling online is the danger of trademark infringement. This can happen if you use an image or slogan that’s been trademarked. It’s hard to keep track of such things, and even many images you find on Creative Commons are actually copyrighted. You’re never 100% sure. Merch Informer helps you stay safe in this area by alerting you if there are any problems. This includes changes, such as a company trademarking a certain design or slogan. This helps you avoid legal problems. Merch Informer offers a few different pricing plans. Unlike many services, you have access to all features with each plan (the Newbie plan being the exception). The only difference is the amount of tracking you have access to. When taking the annual plan, you are paying for 10 months and 2 months are free. Newbie – $9.99 per month or $8.32 per month when you take the annual plan. Basic – $19.99 per month or $16.65 per month when you take the annual plan. Pro – $59.99 per month or $49.99per month when you take the plan. We also have an additional, exclusive 20% Merch Informer discount coupon for our readers. 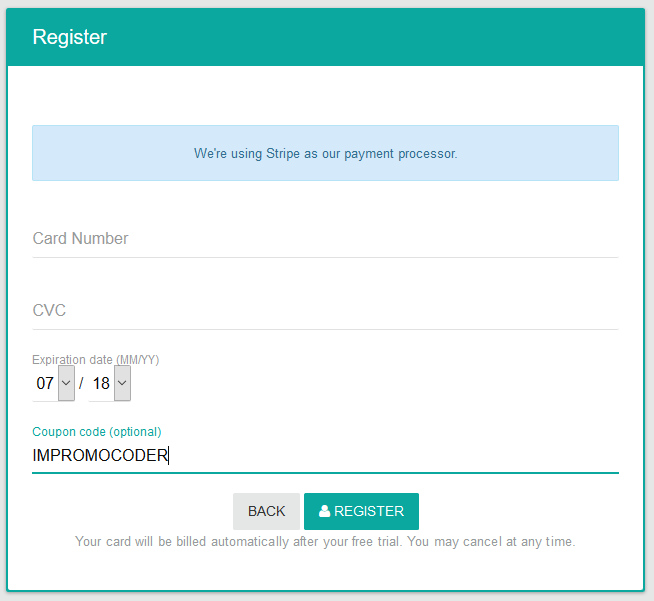 Simply enter coupon code IMPROMOCODER on the checkout page. No matter which payment plan you choose, you get access to all of the features (with the newbie plan being the exception), including 24/7 customer support. The only difference in the plans is how much you pay and how many products/keywords/trademarks you can track. You save money by signing up for a full year. An additional bonus for the yearly plan buyers; Get the annual plan (and enjoy two months free), add our 20% discount and contact us to receive the Merch by Amazon introduction course for free. E-commerce is only going to get bigger over the next few years. While there will always be a place for traditional brick and mortar retailers, they’re finding it harder and harder to compete with Amazon. Now that customers can save money with Amazon Prime and get faster and faster product fulfillment and deliveries, there’s every reason for people to shop from the convenience of home. The challenge facing both new and experienced e-commerce sellers is how to thrive with all of the competition. New online stores are appearing every day. Many are selling t-shirts, often in the exact same niches. If you want to succeed in this environment, you need an edge. Merch Informer provides you with this advantage, helping you save lots of time, choose more profitable niches and keywords, identifying your competition, and avoiding problems such as trademark infringement. Some people, understandably impressed by how easy it is to sell with a POD service such as Merch by Amazon, underestimate the amount of work involved. You do have the advantage of not having to produce, stock or ship your own merchandise or invest money out-of-pocket. However, the catch is that you may have to tests dozens, if not hundreds of designs before you find ones that sell. This causes many online sellers to give up before they ever succeed. Merch Informer helps you in several crucial areas. The ability to do niche and keyword research, study the competition and organize your designs helps make your business more efficient. You won’t waste time trying to sell t-shirts in over-saturated markets. You’ll be able to quickly identify potentially profitable niches within minutes. This is the essential edge that can help you outperform your competitors and succeed with your t-shirts. Merch Informer is recommended for anyone who is selling t-shirts online and, in particular, anyone using Merch by Amazon or who is thinking of doing so.